FORT LEE, NJ--(Marketwired - March 07, 2018) - Inspiration comes from every corner of the world, according to Marlys Giordano, Creative Director at Couristan, the leading importer and manufacturer of fine, quality area rugs and residential broadloom. For 2018, it's all about incorporating color, global-inspired prints and recycled materials to provide a sense of well-traveled, trend-aligned design for the home. 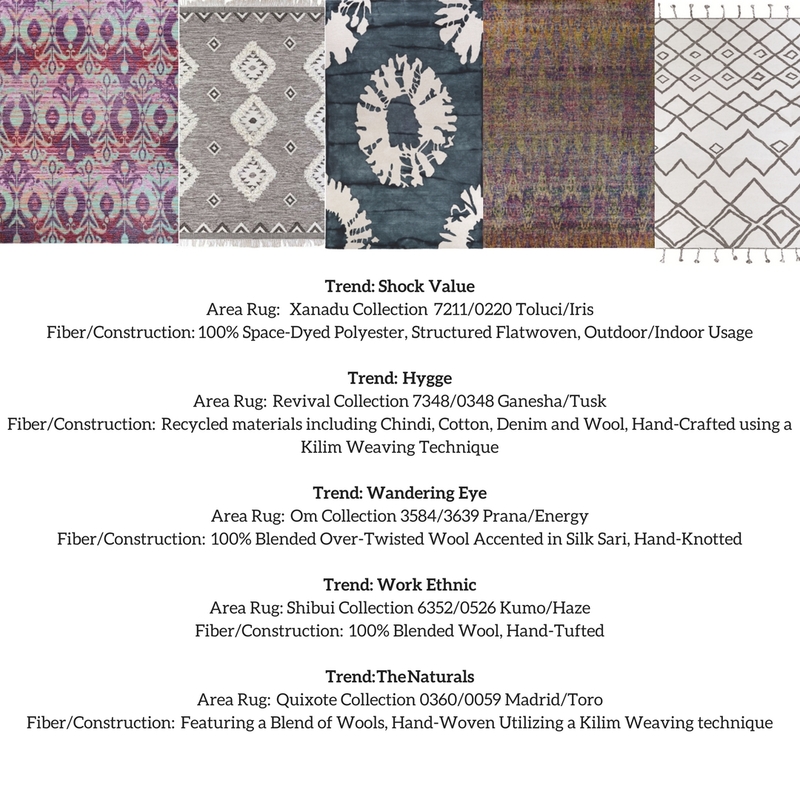 In the company's first-ever Trend Report, Giordano identifies five key trends that have inspired many of Couristan's new area rug collections, introduced at AmericasMart in Atlanta in early January, and further showcased during the Las Vegas Market. Two area rugs inspired by these trends recently received Magnificent Carpet Awards for Best Design in the Hand Knotted/Flat Weave category (Karuna design from the newly introduced Om Collection), as well as the Outdoor category (Toluca in Iris from the Xanadu Collection). 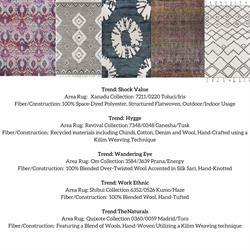 In addition, variations of these trends will be utilized across a newly developed offshoot - Couristan Rug Studio - set to launch later this year. "So much of what comes to life through design is reflective of what's happening across the global community. Individually, the home tends to mirror our personal style, what inspires and shapes us," noted Giordano. "During times of great uncertainty, people increasingly view their home as a sanctuary; a safe haven from the outside world. As a result, people are putting a lot more time, thought and effort into what goes into their homes - and how it makes them feel; this is what we have looked to infuse throughout our new collections." This trend combines vibrant hues, utilized in unexpected applications, giving classic pieces an updated feel. The rugs that answer this trend blend bold motifs with of-the-moment color stories, resulting in classically-modern styles. "Shocks of color can be incorporated in moderation or in abundance," said Giordano. "The key take away is that these designs are meant to work within a home's existing décor, adding color without overwhelming a room." Tribal in feel, this trend draws its inspiration from patterns found in Africa, India, Vietnam and beyond. Utilizing a warm palette, the colors balance beautifully with the neutral foundations found throughout this trend. "Work Ethnic delivers a modern edge when it's blended with contemporary elements and metallic finishes," said Giordano. Cultivated from organic elements and natural fibers, The Naturals trend is clean and light-visualize a sunlit living room in whitewashed detail. "Texture plays an integral role in this trend. We took flat-weaved rugs and added tufts of wool to create texture and depth, using materials in their natural state," said Giordano. "The Naturals trend brings a level of sophistication to consumers that want an earthy look but still like to blend modern and classic elements into their home." Wanderlust is an ideal word to describe this trend, which is inspired by exotic locations like Morocco, Mexico and India. Wandering Eye is influenced by visits to the souk and local markets to uncover all of their hidden treasures-vibrant fabrics, pierced lanterns, painted wood, carved talisman. Combining these elements, the feel is strikingly colorful, with bold geometric shapes and even bolder color palettes. Metallic accents, painted wood and recycled fabrics make this trend feel exotic and eclectic. "Wandering Eye complements the Work Ethnic trend, but offers a much more exotic feel," noted Giordano. "In this trend, we designed area rugs made of recycled Indian Sarees, cotton chindi and denim. In addition, many of the rugs inspired by this trend can be used indoors and out, allowing you to create an eclectic space right in your backyard." Hygge (pronounced "Hoo-Ga") is the Danish art of happy living. It embodies everything that makes a home warm, cozy and inviting to friends and family. This trend incorporates a soft color palette and textural elements that exude a sense of inclusiveness and nesting. "Inspired by looks from Scandinavia and beyond, Hygge Fresh represents a cozy, welcoming feel. This is another trend that utilizes recycled materials like denim, and combines them with neutral wools to create a sense of warmth and simplicity," said Giordano. To book a meeting to review Couristan's 2018 trends email Larry Mahurter at larry.mahurter@couristan.com.